Here's some tablature for a common chord progression that many popular songs are based on. You may hear songs like "What a Wonderful World," and "Cupid," by Sam Cooke, as well as some more modern tunes. I highly recommend singing a song you like as you play these changes. That makes the song come alive. A note on strumming: strum four beats per bar with a pattern that feels natural. Focus on keeping a steady rhythm. You don't even have to use a pick. Your fingers or thumb can strum. The "||:" and ":||" symbols tell you to repeat what's between them. "D.C. al Fine" means to go back to the start and then play until you reach the word "Fine." The following includes some thoughts on why this song sounds as good as it does. You don't need to know this to play around with the song. Feel free to skip ahead. You don't have to read this to simply enjoy playing, but it might help you out. With just a few elementary facts about chords, you can begin writing your own progressions. Let's talk about these facts. *The b* means "b half-diminished," which is kind of like a minor chord, but really closer to a G7 in its overall sound. Do you hear how strongly that sets up C as the key center or tonic? Right after you strum the G7 (the Five), your ear is just itching to hear the C (the One). Just try playing the G7 and don't play the C. You'll feel like there's something important missing, like you forgot to put your underwear on this morning. This chord movement, which shows up in measures 1 and 2 of the Sam Cooke song, is not as strong as the Five One and Two Five movements, but it's just as important. Let's play some examples. Do you hear how close the Ones and the Sixes are? When you move to the A minor from C, it just doesn't feel as final or complete as playing a G7 to C. It's almost like you're playing two different flavors of the same chord. The music doesn't have the sense of completion that a V to I change has. Learn how harmony, chords and chord progressions work on the guitar. Guitar Chords features over 230 illustrations, including 180 chord diagrams. Also, there are 25 tablature examples, each with a MIDI file. 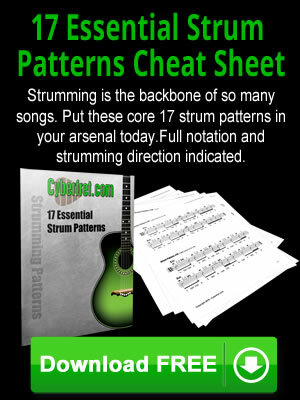 You'll also get charts for Rock, Blues and Jazz so you can begin sounding great immediately.